Welcome to the BCS website. promote recitals and other events. For more information see the Diary. publish a newsletter three times a year, with articles, reviews of concerts, books and recordings, and clavichord news. hold meetings, workshops, and visits to instrument collections and clavichord-makers. run educational events in schools and colleges, and offer sponsorships for young people. maintain a register of clavichord professionals, and provide links to further clavichord-related information. 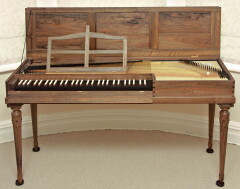 support a project to collate recent information on historical clavichords and their makers. sell clavichord CDs and publications. You are welcome to join us, or to contact us.